Experience cord-free convenience and a reliable connection with the AmazonBasics Wireless Mouse. The optical three-button mouse with nano receiver works with laptops, desktops, and netbook PCs. 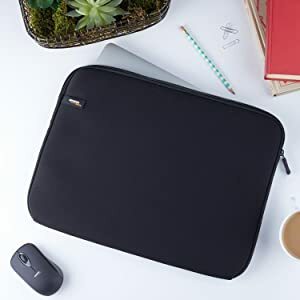 It makes a great choice for home, office, or travel, providing a fast, responsive connection—all at an affordable price. 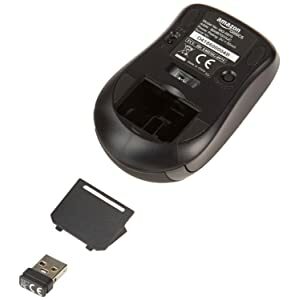 The AmazonBasics Wireless Mouse sets up in seconds. After removing the nano receiver from the battery compartment* and replacing the back cover, simply insert the receiver into the USB port of a compatible computer, flip the mouse’s power switch to “on” (located at the bottom), and it’s good to go. The unobtrusive nano receiver can stay plugged in to a computer or be stowed on-board the mouse when not in use. * Receiver ships inside the mouse’s battery compartment. 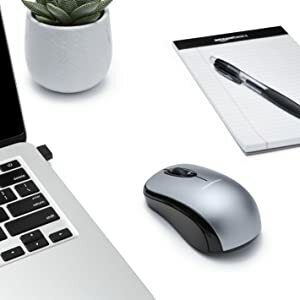 The optical three-button mouse features a 2.4 GHz wireless connection to the nano receiver, which means easy scrolling, fast clicking, and smooth, responsive tracking when highlighting text. The AmazonBasics Wireless Mouse provides a sleek, contoured shape for enhanced comfort, even during extended use.